Prism/Light Guiding Plate | Product Information | NTKJ Co., Ltd. Precision prisms are arranged on a flat surface with their angles aligned and are used to bend incident light in specified directions. NTKJ manufactures and sells not only Prism products on the catalog, but also manufactures custom made Prism products according to our customers' requirements in sizes and design. Please contact us for more details. Prism angles for products start with "LP" are its inclimation from the lens holizontal surface as described in fig. 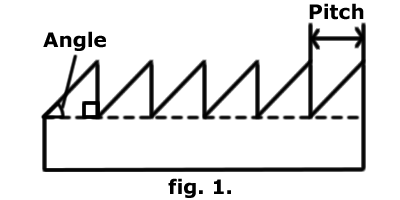 1..
Prism angles for products start with "LPV" are its apex angle as described in fig.2. Also prism's groove direction is as described below(fig.3.). Copyright © 2007 - Nihon Tokushu Kogaku Jushi Co., Ltd. All rights reserved.